The only agent-plus-water fire suppression hybrid on the market today, ANSUL PIRANHA systems outperform all conventional single-agent systems on a number of fronts. Ansul Piranha systems attack fire using the rapid flame knockdown and securing capabilities of PRX™ Liquid Fire Suppressant. 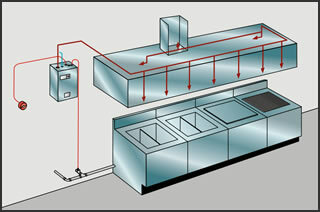 Then, the superior cooling effects of water follow, quickly cooling the cooking media and further helping to prevent reflash. In UL300 testing, the Ansul Piranha system cooled hot grease 15 times faster than single-agent wet systems, required 60% less chemical agent, covered hazard areas better and provided a cost-effective means to protect the cooking equipment. Ansul Piranha systems are available in various sizes that can be combined for multiple configurations to expand the suppression system coverage. Depending on your type of facility, your Automatic Protection Limited will design a system that offers you the ultimate in fire protection.